OTTAWA -- Justin Trudeau remains optimistic that Canada, the United States and Mexico can strike a deal to modernize NAFTA that benefits all three countries. In an interview this week with The Canadian Press, the prime minister said he still believes there's a good chance negotiations will result in what he calls a "win-win-win" -- notwithstanding contradictory signals from the U.S. that have frequently left the impression that the North American Free Trade Agreement is doomed. U.S. President Donald Trump has threatened repeatedly to pull out of the continental trade pact. But Trudeau effectively dismissed such threats as a negotiating tactic. "Our approach has been braced for a certain level of negotiations and back and forth but our approach is consistent, that we know that there is a good deal to be had that will benefit Canada and the United States and Mexico and we're going to stay focused on reaching that in ways that benefit us all," he said. "My assessment that there is a path forward is (based on the fact) that I truly believe, I truly know that NAFTA has been good for jobs in the United States, it's been good for jobs in Canada, it's been good for the Mexican economy. "And there are ways, there is a way to move forward that will end up beneficial, more beneficial than any other path -- bilaterals or termination or whatever. So I do believe there are good chances that we're going to end up in a win-win-win for everyone." Last week, a report that the Canadian government was increasingly expecting Trump to terminate NAFTA caused the loonie and jittery markets to fall. The president subsequently calmed fears about NAFTA's potential demise, telling the Wall Street Journal that he'd "rather keep it" and telling American farmers, who are overwhelmingly supportive of the pact, that he's working hard to improve it. 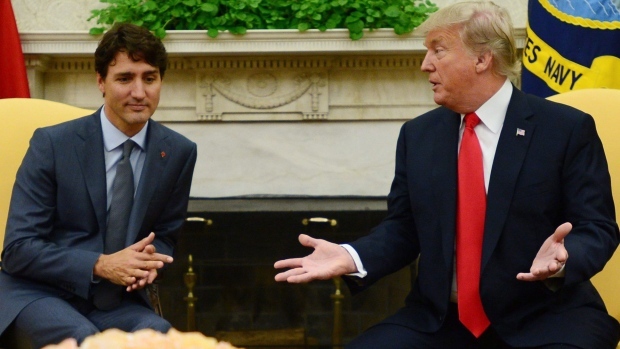 Trudeau suggested there's little be gained trying to trying to figure out where Trump, or the negotiations, are headed. "We don't worry too much about what sort of the news or the narrative of any given day is, because this is a negotiation that is going to take significant amounts of time and go through different phases." The talks appeared to stall before Christmas as both Canada and Mexico flatly rejected a number of unpalatable U.S. demands, including American calls to scrap the independent dispute settlement process, end Canada's system of supply management for dairy and poultry, hike American and North American content requirements for automobiles and add a sunset clause that would automatically terminate the agreement after five years unless all three member countries agree to extend it. Last week, Foreign Affairs Minister Chrystia Freeland said Canada would be bringing some "creative" new proposals to the sixth round of negotiations next week in Montreal, in response to the "more unconventional" American demands. That prompted some speculation that Canada is about to cave in to the U.S. But Trudeau said that's not the case. "We have been holding firm on Canada's interests," he insisted. "We've been very clear to Canadians that we're not going to accept any old deal. We're going to accept a deal that is good for Canadians. And we have been unequivocal on that. We're, of course, always open to discussions on finding that middle ground but at the end of the day we will be only signing a deal that's in Canada's interests. Government insiders and stakeholders have suggested that Canada is prepared to agree to a periodic review of NAFTA, but not one that could result in the pact's automatic termination. They've also suggested Canada will propose adding the computer software that is increasingly ubiquitous in vehicles to the list of auto parts whose country of origin must be traced. That would substantially raise the North American content of cars. At the same time that Freeland was talking about new NAFTA proposals, the government revealed last week that it has launched a broad-based challenge at the World Trade Organization to the United States' use of punitive sanctions. Trudeau pointed to that as proof that his government doesn't intend to cave in on NAFTA. While it won't respond to "threats or intentions made as a part of negotiation," he said his government will stand up for Canadian interests when there are "concrete actions that we can take a formal response to," such as the punitive duties the U.S. has imposed on Canadian softwood lumber and Bombardier which prompted the WTO litigation. "And we do it without malice or anger," Trudeau added. "But I have been very clear with the president from Day 1 that my job is to stand up for and defend Canadian interests and he understands that." If the prospects for NAFTA's survival seem somewhat brighter, Trudeau gave credit to the full-court press Canada has undertaken in the U.S. to persuade political leaders and stakeholders of the benefits of NAFTA and encourage them to speak up in support of the pact. "We've continued to see governors, business leaders, members of Congress speaking up about the positive impacts of NAFTA on their districts, on their states, on their industries," he said. "We set out to highlight the benefits of a relationship that many Americans have taken for granted. And I think we've done a good job as we've heard people speaking up on the benefits of NAFTA." Trudeau has been criticized in some quarters for not denouncing Trump's erratic behaviour and controversial comments. But he said Canadians know this country must maintain good relations with the U.S., regardless of who is president. In any event, Trudeau said he's never shied away from reiterating his own values and no one, including Trump himself, doubts that his views on things like minority rights, feminism and immigration are very different than those of the president.